When we went to see Gigabyte at its headquarters last Thursday, we didn’t know what to expect (apart from more motherboards and graphics cards). 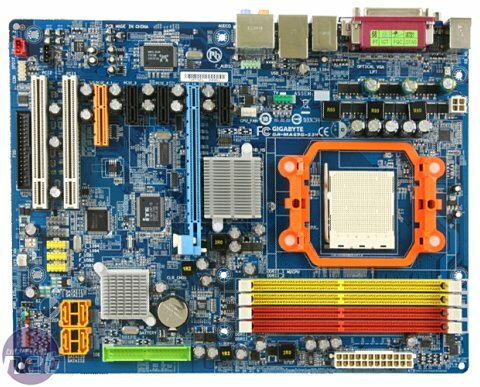 The company had quite a lot of interesting new products on show, which included the first RD790 based motherboard we’ve ever seen, a couple of X38 boards, and probably the most interesting of the bunch was a full-sized ATX 690G board that supports CrossFire. 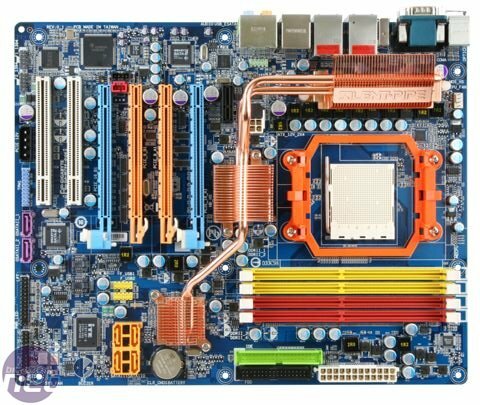 It’s fair to say that Gigabyte has been pushing silent cooling for a long time now, but this became even more pronounced when we looked at its GA-P965-DQ6 last year, because it was the first Gigabyte board we’d seen for a long while that could be considered a true enthusiast’s board. Thus, it wasn't much of a surprise to see Gigabyte's GA-M790-DQ6 kitted out with an equally impressive heatpipe solution. The GA-M790-DQ6 is the first board we’ve seen (outside of AMD reference designs) that supports socket AM2+, AMD’s RD790 chipset and HyperTransport 3.0. There is also support for DDR2-1066 memory and of course AMD's long-awaited Phenom quad-core processors. AMD's RD790 supports 32 second generation PCI-Express lanes, and Gigabyte has chosen to include four PCI-Express x16 slots, which each have eight lanes. However, because the chipset supports PCI-E 2.0, there is the same equivalent bandwidth as four full x16 bandwidth lanes. The four PCI-Express slots are for quad-CrossFire, which we’re expecting to be announced sometime this week. Having said that though, due to the positioning of the slots on Gigabyte’s board, you’re won’t be able to run four Radeon HD 2900 XTs – instead, you’ll be relegated to running four lower-end cards. We'll try and get some more details on this during the show, and we'll be sure to bring it to you as and when we get it. Probably more interesting (at least from the "what's possible" perspective) was Gigabyte's GA-MA69G-S3H mobo, which is based on AMD's 690G chipset. As soon as you hear the words 690G, you'd normally think mATX, integrated graphics. What if I was to say, full-sized ATX, with support for CrossFire? Yeah, I was pretty surprised too. The second PCI-Express slot is an open-ended x4 slot, meaning that you're going to be somewhat bandwidth limited like you are on motherboards based on Intel's P965 and P35 chipsets. It'd be interesting to see if Asus combines its Crosslinx technology with 690G, enabling a dual x8 CrossFire configuration. We're probably clutching at straws here though, because the RD580-based socket AM2 boards are already pretty well-priced. Due to the fact the board also has an integrated graphics processing unit in the northbridge, it's possible to run up to six displays using ATI's SurroundView technology, which is built into the Catalyst drivers. Overall, this is one of the more innovative designs we've seen over the past few days and we can't wait to see what its price point is going to be.